Jose Mourinho labelled Marcus Rashford as “naive” after the Manchester United striker was sent off for a headbutt in his side’s 2-0 win at Burnley on Sunday. Rashford saw red when Burnley defender Phil Bardsley appeared to kick out at the England international after a challenge. The 20-year-old reacted by putting his head into Bardsley’s face, earning the dismissal that prompted a critical assessment from United boss Mourinho. “I don’t know what happened. I would say it was naive. It was a kid and a very experienced man,” Mourinho told the BBC. Rashford had earlier won a penalty that was wasted by United midfielder Paul Pogba, who saw his effort saved by Joe Hart. The miss continued a troubled start to the campaign for French World Cup winner Pogba, who was criticised by Mourinho in the close-season for his erratic effort levels for United. “I never blame a player for missing penalties. I blame the ones who refuse to go up there. Paul’s scored some good ones for us,” Mourinho said. It was still a good afternoon for Mourinho despite the unwanted contributions from Rashford and Pogba. 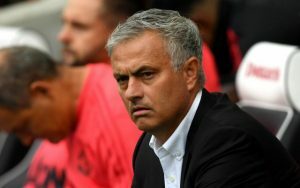 United’s win, secured by two Romelu Lukaku goals, steadied the ship after successive defeats against Brighton and Tottenham had condemned the club to their worst start for 26 years. On the day United fans flew a banner over Turf Moor that was critical of executive vice-chairman Ed Woodward – who has feuded with Mourinho over transfer policy – this was an encouraging result for the Portuguese coach. “It was a very, very good performance. They played very well as a team,” Mourinho said. “The three points were an important thing, the quality of the performance and happiness of the team is an Old Trafford response – the way Old Trafford reacted to the boys in the Spurs defeat was important. “We should score many more goals. The result shouldn’t have been open until the last minute.